The Martin Hicks Gallery at the Belskie Museum of Art, Closter, N.J. proudly presents a unique exhibition of handmade model planes, trains, boats and lighthouses. Most of the models have been built primarily from scratch and are in scale. The ship models range from small in bottles to two magnificent 7 ft. scratch built working replicas of the WWII ships “BISMARCK” AND “HMSHOOD.” Many of the boat modelers are recipients of high awards for their work in exhibits throughout the United States. 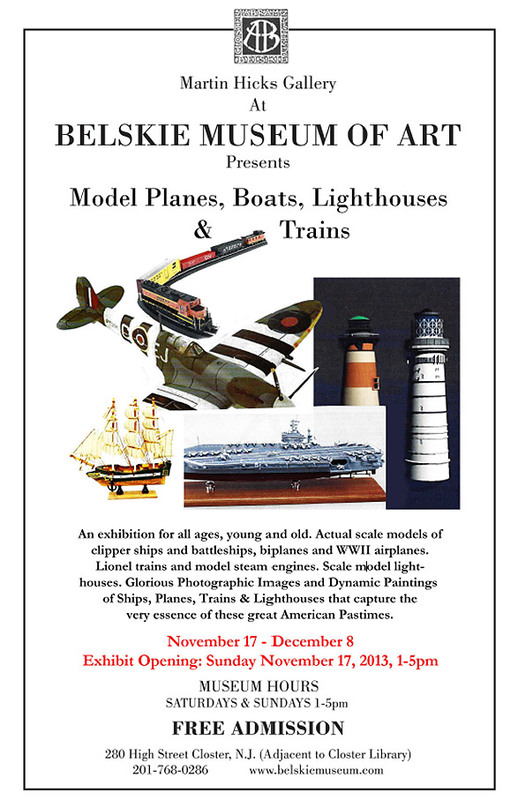 There are well over a dozen boat models, a 4 ft high lighthouse, a 1920’s working train set, and numerous plane models of all sizes and types. In addition to the models on display there are four participating artists–Odd Andersen, Mary Ann Farrell, Scott Farrell and LidaenisFerro– whose paintings and photography reflect the same theme of the exhibit and are available for purchase. This is an exhibit for all ages, young and old, and captures the very essence of these great American Pastimes. We hope to see you soon…and don’t forget to bring a friend! Lots of good stuff on the table last night for the WWI contest. The in-progress table also sported some nice creations, from giant radioactive lizards and Jules Verne inspired submarines, to WWII Japanese cruisers and modern tanks. The next meeting is December (Friday!) the 13th. It’s the annual Christmas party, and dinner will be served. See you all then. A little late in posting, but here are the photos from October’s “Russian Night”. Thanks to Martin Quinn for the photos. The next meeting is this coming Friday, November 8th, and the theme is WWI.